What does Navellier say that "Will set Warren Buffett's Hair on Fire?" … and in order to convince you to subscribe, he’s dropping some hints to whet your appetite for these growth stories. So we’ll see what he’s hinting at, figure out what the stocks are, and then you can think for yourself. If you want to subscribe to Ultimate Growth after that, well, be my guest… but don’t ever subscribe to a newsletter just to learn about a “secret stock.” Not when your friendly neighborhood Gumshoe is on the case to sniff out those secrets for you. Oh, and in case you’re extra-motivated by the “only five hours left” pitch about the “sale price” for the newsletter… don’t get too excited, not many of the high-priced newsletters actually get sold at retail prices very often, they get put “on sale” all the time… when Navellier was pitching Ultimate Growth last October it was being offered at $2,800 a year, then in April he offered it at $1,695/year, and now it’s $1,595. Deflation: Another reason to put off purchases. And in case you’re wondering, the three teaser picks he pitched last October for this service are not doing so good: LCI Industries (LCII, which is the new name and ticker for Drew Industries, formerly DW) is up about 4% as of now, DRDGold (DRD) is down 37%, and The Meet Group (formerly MeetMe, ticker MEET) is down about 6%, all while the broad market is up about 15%. 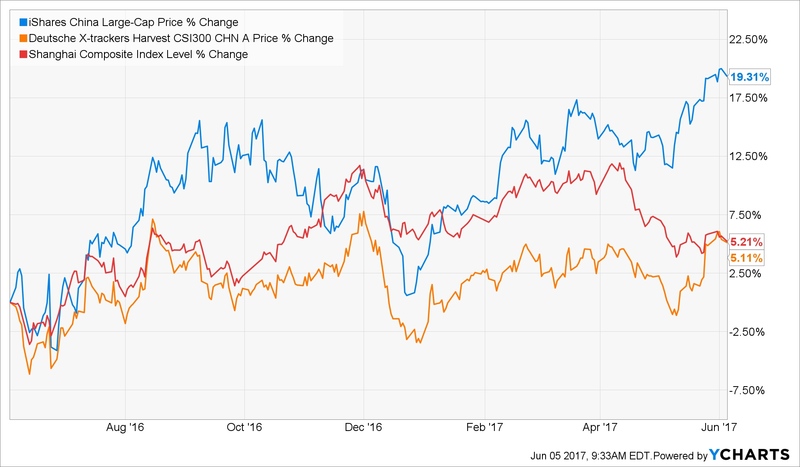 The more recent April picks were more successful, at least so far, with Health Insurance (HIIQ) up about 40% in two months and Ubiquiti Networks (UBNT) staying pretty close to the market’s performance with a 1% drop (the S&P 500 is up 3.5%). So hopefully that’s a little splash of cold water that shakes away some of the “must get in today!” urge that the copywriters are so skilled at manufacturing in our brains… what, then, is Navellier’s pitch today? “China stocks just pulled back to a 7-month low thanks to a surprise credit downgrade and a crackdown on China’s shadow banking industry. “As I told you right from the start, I simply don’t care about possible long-term issues with China’s debt or regulations when it comes to the stocks I’m buying today. All that is just to show that there’s no obvious point where China has dipped to a buying opoportunity — except in retrospect. And that the weakest indicator, the Shanghai index, is the one you can’t really buy directly. “Demand #1: Spectacular earnings growth…. “The stocks on my buy list today deliver an average 76.9% forecasted earnings growth…. “Demand #2: Spectacular sales growth. “The stocks on my buy list today deliver an average 32.3% forecasted sales growth…. “Demand #3: A history of positive earnings surprises…. “Demand #4: A reasonable PE…. I’d call Weibo the biggest microblogging site in China, but that depends on how you categorize things — probably what Navellier is implying is larger is Tencent’s QQ or WeChat services, both of which have more users but neither of which is quite the same kind of service. Splitting hairs, I suppose, and both Tencent and Weibo are experiencing pretty massive growth in ad revenue to supplement their other earnings in gaming, premium content and services, etc. And, of course, both are expensive — Weibo trades at 116 times trailing earnings… though with expectations of $1.49 in 2017 earnings, $2.30 in 2018 and $3.22 in 2019, you can probably talk yourself into the valuation if you wish. WB is at about $76 today, so that’s about 33 times forward earnings — by way of comparison, Facebook (FB) is at 25X forward earnings, Twitter (TWTR) is at 43X, Tencent (TCEHY) at about 29X, NetEase (NTES) about 15X. Weibo is pretty small still, with a market cap around $15 billion… and it is still effectively controlled by Sina (SINA), which created Weibo and owns 49% of the company (they’re spinning out some more WB shares to SINA shareholders this week, so that will go down to 46%), I don’t know what their timeframe is for distributing the rest of WB shares, or if they intend to do so at all — SINA’s other businesses are valued at about $2 billion right now, so for quite some time the Weibo tail has been wagging the SINA dog. Beyond that, you can make your own call on whether or not WB looks appealing. They do fly under the radar a little bit thanks to the extraordinary dominance of Alibaba (BABA) and Tencent (and, to a lesser extent, Baidu (BIDU)) when it comes to China tech giants, and they are small enough that they could be acquired… but they are also very levered to social networking and are therefore very much in the government’s crosshairs whenever #SocialUnrest pops up as a trending topic on the Politburo’s news feed. 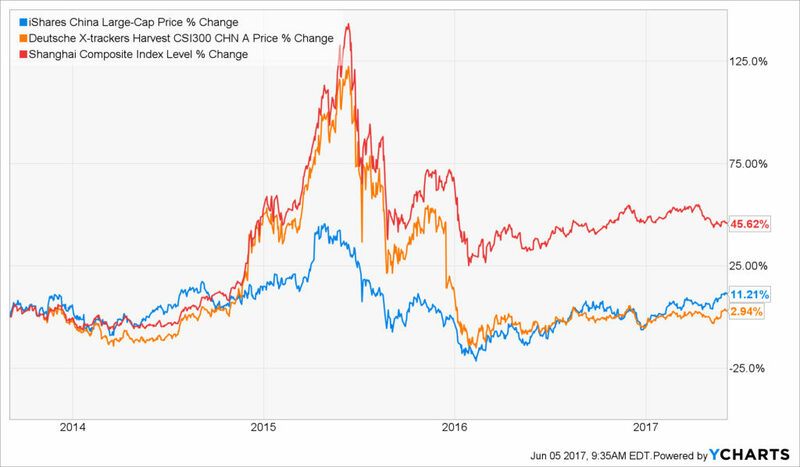 The revenue growth for Sina and Weibo has been impressive for a decade or more, but earnings have been much less predictable… and the share price has been wilder still, driven by abrupt changes in sentiment, so if you’re excited about this opportunity I’d urge you to be ready for a bumpy ride. Navellier has called this his favorite Chinese internet stock before, and it has consistently been an “A” rated Strong Buy in his Portfolio Grader system for a year or more. This must be, sez the Thinkolator, little SORL Auto Parts (SORL), which does indeed make brake systems and other parts for cars and trucks, though they are more focused on the commercial truck market. The stock did soar dramatically higher after they released blowout earnings in mid-May, but it’s also a teensy, tiny stock with a market cap of only $170 million and no meaningful analyst coverage so it’s not too difficult to have a “surprise” in a given quarter. The stock does now look dirt cheap with a trailing PE of about 6.5 and a long record of profitability (they’ve been earning anywhere from 50 cents to a dollar per share every year over the past ten years). The last time the share price was this high was early in 2010, when they were just headed into their previous high for annual earnings right near the current $1/share, if I were researching this one I’d want to dig in and try to understand how the prospects look for growth from this level (or if they’re plateauing in earnings again, as they did five or six years ago) … the underlying growth of the auto and truck markets in China should be strong, I expect, but this is a tiny company in a large industry so little things like contract wins with particular manufacturers will likely make a large difference. Here’s the history of SORL’s grades in Navellier’s portfolio grader, FYI. “For the fourth quarter the company reported that total net revenue surged 137% year-over-year to $154.3 million. “That’s already impressive, but let this sink in for a minute…net income soared a stunning 356% year-over-year to $54.7 million. “Earnings per share increased 10% year-over-year to $0.92, which walloped analysts’ estimates for $0.33 by 178.8%. So this is the Chinese P2P lender Yirendai (YRD). Unlike the US peer to peer lending firms lke LendingClub (LC), they’re actually making money — but that’s about all I know about peer to peer lending in China. I suspect that the valuation is quite low mostly because everyone and his brother is warning us about China’s unsustainable debt craziness, but perhaps that will mean opportunity for those who are willing to take the risks. Analysts expect earnings to dip a little bit this year, but to restart growth again in 2018 — so the stock is trading at about 10X 2017 estimates and 6X 2018 estimates. “China is undergoing the same massive transition today that the U.S. went through during the Internet boom of the late 1990’s. “Job listings, used car sales, travel reservations, dating…all facets of everyday life and commerce are transitioning online…. “And the next company I want to tell you about is at the nexus of it all. It got its start as a dating app in 2011, but has quickly branched out. How about some specifics that we can feed to the Mighty, Mighty Thinkolator? I thought you’d never ask! “The company has been adding users at a furious pace, jumping to more than 81 million monthly active users in 2016…. “The company has monetizing users through paid content, premium membership and in-app purchases down to a science…. “Earnings per ADS jumped 633.3% year-over-year to $0.44, up from $0.06 per share in the same quarter a year ago. That walloped analyst estimates, posting a stunning 46.7% earnings surprise and a 28.4% sales surprise. “And there is no end in sight. Looking ahead, the company expects first quarter revenues between $238 million and $243 million, which represents 367% to 377% annual sales growth. So… hoodat? Thinkolator sez this is the Chinese social networking app-maker Momo (MOMO). Which I know next to nothing about, but it sure has been soaring, up about 300% from its lows last June and more than doubling just this year. And it is profitable, with earnings growth expected to continue at a pretty steady pace — analysts think they’ll have $1.51 in earnings this year and $2.17 in 2018, which gives them a forward PE of about 18… a perfectly reasonable price to pay for that kind of growth IF that growth materializes. So… those are the four stocks that Navellier hints at (out of seven that he says he is recommending for this “red hot momentum” trade for the next 12 months)…. as is often the case, most of these come down to “decent valuation if the growth is real.” I can’t tell you where the story goes from here, but there is at least some pessimism priced into China shares in general this year, and there is tremendous underlying growth in revenue and earnings for most of these stocks (and for many others in China as well, of course). I have not been able to talk myself into buying any individual Chinese stocks recently… but perhaps you can talk me into it. Have any favorite momentum stocks in China you’d like to urge us to consider? Either among these four stocks, or others you prefer? Let us know with a comment below. P.S. We haven’t heard much from recent Navellier subscribers about their experiences, so if you’ve ever subscribed to Ultimate Growth (or its predecessor, Quantum Growth), please click here to share your opinion with your fellow investors. Thank you! Disclosure: I currently have call option exposure to the ASHR ETF in my portfolio, with June 2017 and January 2019 calls that are currently out of the money, and I own shares of Amazon, Apple, Alphabet and Facebook among the stocks mentioned in this article. I do not have exposure to any of the other stocks mentioned above, and will not trade in any covered stock for at least three days per Stock Gumshoe’s trading rules. 17 Comments on "Navellier’s “Urgent Buy Alert” in China — He Says “This Massive Buying Opportunity Won’t Last Long”"
More into Tencent mainly because they own Wechat and the fact that you can buy/pay in china with wechat , and exchange money by transferring cash between account . Tencent has certainly been a winner for a long time, a strange little chat network system with emojis and games that grew well beyond expectations to become one of the largest companies in the world.. it has been recommended and teased by a bunch of different newsletters of the years as well. Tencent is good, I’m long. Sjuggerrud is a fan and he’s good. He thinks that Tencent is going to become the biggest corporation on hearth. We’ll see. I’m also long MOMO as long as it remains above the Ichimoku cloud. I also bought ZX from a technical perspective, volatile though. Why buy the Twitter of China when you can buy the real American Twitter. A bargain at $18.5. Funny he did not mention ATHM – At home. The Chinese Zillow and New car buying site. Hi Travis this is off subject but I am just wondering if you have any info on this new report. Although not scientific evidence or a particularly well-defined metric or indicator, but I do not know of a Chinese immigrant to the United States that doesn’t use WeChat (from TenCent) and I know a lot of Chinese immigrants! Any ideas about the magnetic marvel being pitched by Navellier for Emerging Growth? Travis, Looking several months later, were Louie’s recommendations worth buying? i have heard some talk about a Chinese co touted as the next Chinese amazon, & with little fanfair or inst promotin, or really any hype much at all, perhaps it is a sleeper ready to wake up anytime. baozun “bzun” any possibilities you think. please holler loud, I just bought 100 shares! Subscribe to all his newsletters and then do my own research. But about 80% of his recommendations, and sell when he recommends most of the time. Usually put in limit order somewhat below his price and ditto selling a bit above. 17.2% return on my overall portfolio in year ending 8/31/17… will be higher when Sept returns included. I’m quite happy with his overall strategy and recommendations. I am liking FISMX; even though it’s a fund, they have Tencent in the top holdings and several others. Up about 6% in less than 2 months. I mean…could be worse, right? "High volatility growth stock" monthly newsletter, has a large recommended portfolio of stocks that screen well for earnings growth, earnings momentum, revenue growth, analyst estimate increases and "beats", and other metrics Navellier focuses on. Focuses more on Large cap stocks. Navellier's Quantum Growth was a previous newsletter with a similar strategy. What's the "like NVIDIA was a year ago" stock from Navellier's Ultimate Growth? What's Navellier teasing in Gold, RVs and Social Networking?